Prep time: 5 minutes Cook Time: 5 minutes With hearty chicken breast, fresh tomatoes, and smooth avocado, this recipe has the right amount of protein and energy to keep you going all day long! 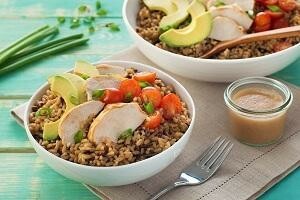 Divide rice among 4 shallow bowls; arrange chicken, avocado and tomatoes on top. Sprinkle with green onions. Whisk together oil, vinegar, mustard, salt and pepper until blended. Drizzle over rice bowl.